XTC were a New Wave band from Swindon, England, active between 1976 and 2005. Though the band enjoyed some significant chart success (including the UK hits "Making Plans For Nigel"  and "Senses Working Overtime" ), they are more known for their long-standing critical success than for making hit records. First coming together in 1972, the core duo of Andy Partridge (guitars & vocals) and Colin Moulding (bass & vocals) went through many band names (including The Helium Kidz and Star Park) over the next five years. As the Helium Kidz, they were featured in a small NME article as an up-and-coming band from Swindon. Drawing influence from the New York Dolls, particularly the "Jetboy" single, and the emerging New York punk scene, they played glam rock with homemade costumes and slowly built up a following. Drummer Terry Chambers joined in 1973. Keyboard player Barry Andrews followed in 1976, and the band finally settled on a name: XTC. By this time, the punk rock movement was in full swing, and XTC had found their style, a unique brand of hyperactive pop mixed with funk, punk, ska, reggae, and art rock. In 1977 XTC were signed by Virgin Records. They recorded the 3D - EP that summer, and followed it up with their debut LP White Music in January 1978. White Music received favorable reviews and entered the British top 40, but lead single "Statue of Liberty" was banned by the BBC for making allegedly lewd references to the famous statue ("in my fantasy I sail beneath your skirt"). The group also picked up a cult following in Australia thanks to the support of the nationally-broadcast music TV show Countdown, which screened all of the band's early videos (beginning with their first Australian single release, "This Is Pop") and the group made two well-received tours there in 1979 and 1980. Their second album Go 2, released later in 1978, is noted for its distinctive typewriter-text cover (designed by Hipgnosis) and early pressings were accompanied by a bonus disc Go +, a collection of dub mixes of songs from the album. Following its release, Barry Andrews left the group and was replaced by guitarist and keyboardist Dave Gregory. Andrews went on to form Shriekback and also worked with Robert Fripp's League of Gentlemen. 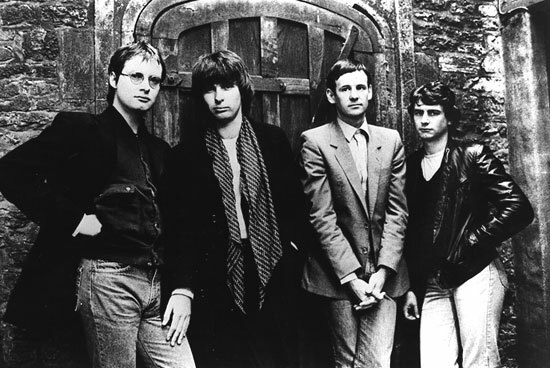 Coinciding with Gregory's arrival, XTC scored their first charting single in the UK with "Life Begins at the Hop", which also marked Colin Moulding's debut as a songwriter. The replacement of Andrews' distinctive keyboard playing with Gregory's Sixties-influenced guitar style steered the band on a path towards a more traditional rock sound; Gregory also contributed occasional keyboards (and later, string arrangements). Their third album Drums and Wires contained the band's first major hit single "Making Plans for Nigel", which caused a minor controversy because of its lyrical reference to British Steel. The album found the band branching out into more overtly political topics, culminating in the unhinged ranting of "Complicated Game", which became one of the band's most well-known non-hits. Drums and Wires also marked their first sessions at London's Townhouse Studios. The studio was at the time much sought after for its highly reverberant "live" drum room, and it was greatly favoured by their producer of the time, Steve Lillywhite and his engineer Hugh Padgham, who were at that time also working with Peter Gabriel and Genesis. During this period, Partridge further indulged his love of dub by releasing a solo LP, released in 1980 under the name 'Mr Partridge'. The album, Take Away/The Lure of Salvage, featured radical dub deconstructions of music from the preceding XTC albums. Later the same year Moulding and Chambers released the "Too Many Cooks In The Kitchen" single under the name The Colonel. Their 1980 LP Black Sea marked another significant step forward in both songwriting and recording, spawning the hit singles "Sgt. Rock(Is Going to Help Me)" and "Generals and Majors". In the film clip of 'Generals and Majors', Sir Richard Branson (founder and at the time chair of the band's record label, Virgin) has a cameo role and can be seen as one of the 'majors'. The song "Sgt Rock" namechecks the comic book character of the same name, reflecting Partridge's lifelong obsession with American comics, particularly the work of Steve Ditko. The last major hit of XTC's touring phase was "Senses Working Overtime", the first single from their double album English Settlement and a top 10 hit in 1982. At the peak of their popularity, the band embarked on a major tour, but Partridge suffered a mental breakdown on stage during one of the first concerts of the tour in Paris on March 18, 1982. Andy Partridge's breakdown, which manifested itself as uncontrollable stage fright, was reportedly precipitated by his wife throwing away his supply of Valium. According to the band's biography, Andy had become dependent upon the drug after it was prescribed to him as a teenager during his parents' divorce. He reportedly was never withdrawn from the drug and became dependent on it. Concerned about her husband's dependence on the drug, Partridge's wife threw his tablets away � without seeking medical advice � just before the Paris concert. Partridge particularly needed the medication to cope with the grinding monotony of concert touring, which he had always hated, but had endured for the good of the band. As a result, when deprived of the medication Partridge suffered anxiety attacks of such severity whilst touring that he was soon forced to withdraw permanently. The European and British dates were cancelled and after completing only one show in San Diego the whole US leg was also abandoned. Since then, XTC have been exclusively a studio band, although they have given occasional live-to-air performances from radio stations, and have made a handful of TV appearances as well. Chambers left the band shortly thereafter, during the recording of their 1983 album Mummer (his last recording on the track "Toys"). He was unhappy with the confines of the studio, and also felt the loss of income that resulted from their withdrawal from touring (he did not write, and so received no publishing royalties). Another major factor was his relationship with his Australian girlfriend; they subsequently married, and Chambers migrated to Australia and settled in Newcastle, New South Wales. Rather than finding a replacement, XTC have used a series of session drummers over the years, including Peter Phipps, Prairie Prince of The Tubes, Dave Mattacks of Fairport Convention, Pat Mastelotto of King Crimson and Mr. Mister, Chuck Sabo, and Dave Gregory's brother, Ian Gregory (as "E.I.E.I. Owen"). Mummer took the group's music in a more pastoral direction with songs like "Love on a Farmboy's Wages", but their next album, 1984's The Big Express marked a return to the harsher and more abrasive sounds of their early albums, but the combination of the group's 'no touring' status and the growing disenchantment of their label made it their poorest selling LP to date. The album was nonetheless a personal high point for Partridge, who considers songs such as "(The Everyday Story of) Smalltown" and "Train Running Low on Soul Coal" amongst the best he has ever written. In 1986, the band travelled to Todd Rundgren's rural studio in Woodstock, New York to record Skylarking. Although the pairing of XTC and Rundgren was highly anticipated by fans, the sessions were less than enjoyable for the band. Rundgren had been hired to trim the band's studio excesses and return them to commercial success. Prior to the recording sessions, Rundgren listened through demos of the songs, chose 15 for the record and worked out a sequence for the album. Being accustomed to creative independence in the studio, Partridge resisted Rundgren's decision-making role as producer. Rundgren and Partridge clashed frequently during the recording of Skylarking and when it was finished Partridge said that he was not at all happy with the resulting product. Partridge has since softened his view, describing the album as "a summer's day baked into one cake." Skylarking spawned the controversial track "Dear God", which was originally issued as the B-side of the album's first single, "Grass". Interest in the song saw the US album re-pressed with "Dear God" included and the new version of the LP sold 250,000 copies in the USA, reviving the band's commercial fortunes and earning critical accolades. "Dear God" replaced "Mermaid Smiled" on the American version of the album and the latter track was finally reinstated for the remastered reissue of Skylarking CD in 2000. The band's follow up, Oranges and Lemons, produced by Paul Fox, was their biggest seller yet, with the videos for "The Mayor of Simpleton" and "King for a Day" getting heavy airplay on MTV and other international music TV programs. It was during this period that Partridge began a relationship with an American fan, Erica Wexler, the niece of famed American record producer Jerry Wexler. Although signs of the failing of Partridge's first marriage were evident as far back as English Settlement (notably on the album's closing track, "Snowman"), it was some time before the still-married Partridge felt comfortable with Wexler's advances; this awkward situation was chronicled in the song "Another Satellite". However, the relationship finally came to fruition after Partridge's first wife Marianne left him. During their long career, XTC have also released material under a variety of pseudonyms, including two albums of psychedelic parodies as "The Dukes of Stratosphear" (ultimately released on a single CD, Chips from the Chocolate Fireball, simultaneous with the second album's vinyl release), a Viz promotional single as "Johnny Japes and his Jesticles", a Christmas-themed single as "The Three Wise Men" and a guest appearance on their own tribute album Testimonial Dinner as "Terry and the Lovemen". Their 1992 album Nonsuch (named after Henry VIII's fabled palace), united them with famed UK producer Gus Dudgeon (renowned for his 1970s work with Elton John) and drummer Dave Mattacks (Fairport Convention). The album featured the US and UK hit tunes "Dear Madame Barnum" and "The Ballad of Peter Pumpkinhead", the latter bringing the band perhaps its greatest success after the early 1980s. (The video for the song drew intriguing parallels between the deaths of Jesus Christ and John F. Kennedy.) In spite of the LP's success, soon after its release a contractual dispute with their label, Virgin Records, saw XTC go "on strike" from 1992 through 1998, which finally resulted in the termination of their contract. They released no new material during this time, although Virgin did issue two compilations -- the 'rarities' collection Upsy Daisy Assortment, which featured single B-sides and other rare non-album tracks and the 2-CD set 'Best Of' collection Fossil Fuel: The XTC Singles 1977-1992, which featured remastered versions of their singles, including many tracks not previously issued on CD. Management and contractual problems had dogged the band throughout their career, and around the time of the recording of Nonsuch they had to make a legal settlement with their former manager. Although most fans assume (and the lyrics of "I Bought Myself a Liarbird" from The Big Express imply) that there was some financial impropriety involved, the terms of the settlement imposed a "gag" on the band and have prevented them from speaking publicly about the matter. The final straw for the band was Virgin's scuttling of their 1992 single "Wrapped in Grey". This was pressed up in the tens of thousands but recalled and destroyed by the label, who unilaterally decided it had no prospect of charting. The band asked that Virgin either allow them to re-negotiate their contract or release them, but the label stalled for years until finally agreeing to release them after a change of management at the company. After leaving Virgin, Partridge had their accounts audited and it was discovered that the company had withheld substantial royalty payments from them. The settlement of the accounts provided the group with much-needed cash flow, allowing Partridge and Moulding to install fully-equipped studios and work comfortably at home. Though able to record the majority of their work themselves, they also used major commercial studios (including Abbey Road Studios in London) for some sessions. Finally released from Virgin, they formed their own label, Idea Records, and embarked on the recording of the ambitious "Apple Venus" project, a collection of the best material written during the band's dispute with Virgin. The band's initial plan had been to record a double album, featuring one disc of acoustic and orchestral songs and one of electric songs. However, financial constraints forced the band to abandon the double album plan and finish and release the first volume before completing the second. However, this did not prove to be the end of their problems. To the disappointment of fans, Dave Gregory abruptly left the band during the recording sessions for Apple Venus Volume 1 after 20 years' service. Ostensibly, this was due to "musical differences" -- Gregory was unhappy with the plan to record an album whose arrangements relied largely upon orchestral instruments and keyboards rather than guitars. What was not mentioned at the time was that the cutting back of his involvement in the new XTC recordings, (the string arrangements having been taken over by Andy Partridge), meant considerably fewer "points" in the calculation of royalties; as Gregory never wrote any songs for the band, this put a significant dent in his potential income from the album, basically reducing his payments to that of a session musician. In the end, Gregory was credited as a session musician rather than as a band member on the finished album, as he left before it was completed. Partridge later claimed in a press interview that he and Colin were going to sack Gregory anyway because of his sullen attitude during the recordings, and that they had waited for him for six years to write the orchestral arrangements, and had finally told him that they would not let him stop the project. Dave Gregory's contribution to the XTC sound had been immense; the technical skill of his guitar and keyboard playing, and his orchestral scoring, had facilitated a huge expansion in the group's sonic possibilities. His skills also encouraged, perhaps goaded Partridge to new heights of musicianship. It is some measure of how fond of him the XTC fanbase were that they slammed Moulding & Partridge for forcing his departure on the band's official forum � and some measure of their mutual respect for their fans and Gregory that the criticism went uncensored. The three got back together for a charity reunion of their Dukes of Stratosphear alter-egos years later, and in late 2006 Partridge revealed that he and Gregory had rekindled their friendship. The band's next record, Wasp Star (Apple Venus Volume 2) was the guitar-heavy collection Gregory would have preferred. Partridge and Moulding then released instrumental and demo versions of the two Apple Venus albums. In October 2005, the two original albums and the demo versions of the albums were reissued together in the 4-CD Apple Box collection. Having left Virgin, relations between XTC and their former label improved and Andy Partridge released a series of albums of demos of his songs (mainly from the Virgin years) under the title of Fuzzy Warbles beginning in 2002, on a new label imprint APE. Colin Moulding declined to contribute his demos to the series. The Fuzzy Warbles series eventually included eight volumes along with a bonus CD, Hinges. A boxed 4-CD compilation, Coat of Many Cupboards, spanning the band's time with Virgin, was also released in 2002. Partridge said, in an interview on a Todd Rundgren fansite in February 2008, that Moulding has moved and changed his phone number, effectively ending all contact between the two. The only correspondence they have is through e-mails via their manager, discussing the dividing of the band's assets. Partridge also said he and Gregory, their differences now resolved, have considered working together again. Yes I believe my musical partnership with Colin Moulding has come to an end. For reasons too personal and varied to go into here, but we had a good run as they say and produced some real good work. No, I won�t be working with him in the future. In a December 2008 internet radio interview, Moulding resurfaced to confirm a recent uninterest in music. He also confided that the break up of XTC was partly caused by financial disagreements but stated that he and Partridge were again communicating. In 2009 remastered re-issues of several XTC albums are planned. Included will be re-worked previously unreleased tracks with contributions by Moulding.